In Canada we still have a few weeks until school starts. We actually are starting late ... September 8th will be the first day for the kids in our area. I noticed on social media that, in the US, most children have started back. Being a work from home momma, I am counting days until my little ones return. At this point they are sick of each other and I am getting sick of having in my hair all day. We need the routine back and a little distance to make the heart grow fonder. 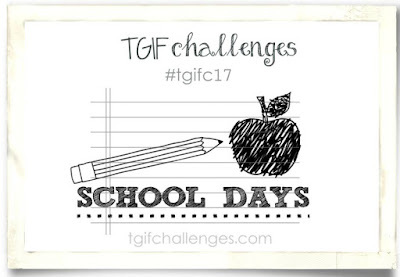 The TGIF challenge this week is all about back to school! I created the cutest gifts for my kids to celebrate the first day of school. I am going to put them on their breakfast plate that morning. This one is for our little girl. She is starting grade 2. She has been struggling with anxiety and school is not easy for her. She is wonderful academically and everyone truly loves her. But for some reason she is very uncomfortable there. For this, I wanted her to know that she can do it! This one is for our big boy starting Kindergarten. I am sure there will be a few tears ... but in the end I am still proud of him. I know he is going to be brave and run into class without looking back. That is just his personality. This one is for our big girl, starting grade 4! yikes ... how did I get here! She is funny, outgoing and eclectic. She is in fact a rock star, I just wanted her to remember that! I was so grateful that the TGIF Challenges had this school theme this week. I am now waaay organized for the first day of school and that feels fantastic! Visit the TGIF Challenges site and see all of the creations that the design team has created for you this week. You are going to be so inspired and are going to want to play along!